Small adwords campaigns are relatively straightforward to run. But what happens when you need to scale up to large campaigns, which can be extremely cumbersome and unwieldy? In this article, we’ll look at one way to solve this problem, using the Google Adwords Editor and spreadsheets. What Is The Google Adwords Editor? 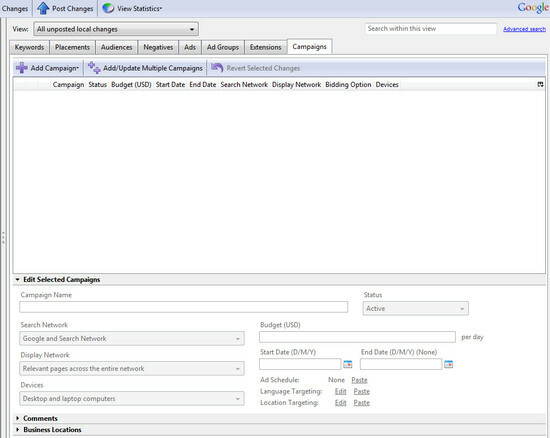 Google’s Adword Editor, available for free here, is a desktop application for managing your Adwords campaigns. The tool features all the groups, campaigns, and statistics, just like you have available in the online interface, however as it runs locally, you don’t have to wait for the screen to update. The Adwords Editor also provides a few extra features, including ad scheduling and custom location targeting. You can make all your changes locally, without affecting your live account, until you’re ready to upload. The interface is self-explanatory for those accustomed to Adwords. There are tabs that represent keywords, placements, audiences, negatives, ads, ad groups, extensions and campaigns. Flipping between the various options is significantly quicker than using the online version. There are also a number of helpful keyword shortcuts. You can do everything you can do in the Adwords interface, and more. When you want to upload the changes, hit the “Post Changes” button. Keep in mind that significant changes – tens of thousands of keyword changes – may take time, as the application has to talk with Google’s servers. If you want a fast response, it’s a good idea to post changes one campaign at a time. With a small campaign, we micromanage the details by hand. We organize keywords into small adgroups. We seperate out the keyword themes. We painstakingly hand-write the adcopy. But that’s an impractical approach when we switch to managing large campaigns, because there is often too much data to handle. Try using a spreadsheet. It’s a good idea to get into the habit of using a spreadsheet for large campaigns, as it makes it easier to cut n’ slice the data using formulas, as opposed to having to manually adjust all your data by hand. 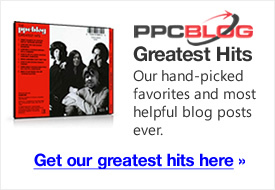 ….and any other variables you commonly use, such as Maximum CPC. Once you’ve organized your data, you can copy and paste it into the Adwords Editor. Click the Keywords button, followed by the make multiple changes button, and select the “Add/Update Multiple changes” option. You then need to set up your bids, budget, and other settings. Similarly, you can use the spreadsheet for creating ad-groups, and managing your copy. Copy can be manipulated by finding and replacing terms to make the copy relevant to each keyword group. For example, if keyword is a member of group X, adjust copy to include keyword from group X, but exclude term Y etc. It’s the same strategy we use when we write ads by hand in that we keep the copy tightly integrated with the keyword terms and intent, however spreadsheets allow us to add a level of automation, essential for managing large data-sets. The level to which you automate is only limited by your spreadsheet skills. Creating spreadsheet formulas is a little outside the scope of this article, however I’m sure you can think of ways to cut and slice the data in order to form and manipulate thousands of groups. The Adwords Editor allows you to import every data type you use in your online campaigns, so try using a spreadsheet as the basis for your Adwords strategy, and Adwords Editor to pull it all together. Great tutorial! Creating and managing large campaigns is always a challenge with the sheer quantity of data, and even Adwords Editor can be a little difficult to use efficiently. The keyword shortcuts are new to me. Thanks for pointing them out.